A very tired climber, on the long descent from Mt. Jefferson's summit, crosses the crevasse fields on the east side of Mt. Jefferson. 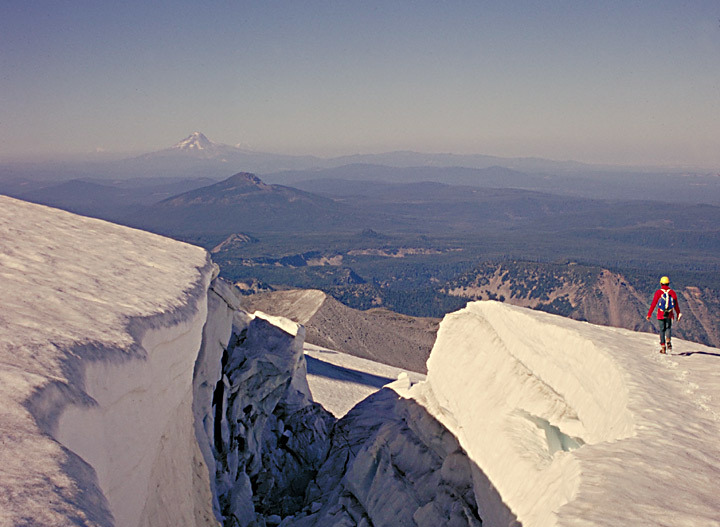 He began the climb well before dawn, and now it's 5 p.m., with still a long, rugged descent before the comforts of Jefferson Park (a meadow with several lakes)...."Jeff" is Oregon's second highest peak at 10,497 ft, and the general climbers' consensus is that Mt. 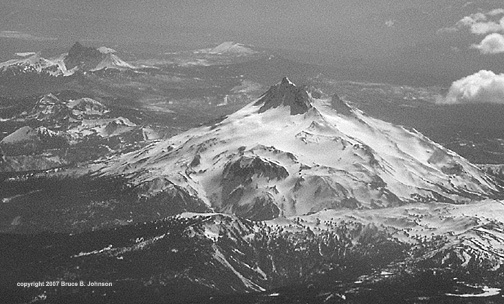 Jefferson is Oregon's most difficult major snow peak. Below is an image of Mt. Jefferson's NE side taken from a jet airplane by me in late spring 2007 with a small digital camera. The Whitewater Glacier shows prominently along the east side of Mt. Jefferson. To its north can also be seen the treacherous Jefferson Park Glacier. The peak of Three-Fingered Jack is seen to the south (please click this link to my Three-Fingered Jack coverage).